It is not a secret that I am a big fan of Shared Actions. A project without at least one shared action is a big exception to me. From what I hear and read, lot of you don't realize how much time you can save with those mysterious action. This short article will offer some ideas where Shared Actions are used for (maybe) a totally different situation than you expect. v_null: an empty variable used to check if Text Entry Boxes remained empty after a learner clicked its Submit button, or to reset the variable associated with a TEB. Knowledge fact: when you import a shared action in another project, variables not defined as parameters, will be created including the description and default value. 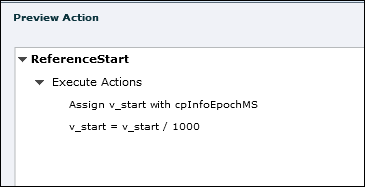 I have a shared action with a list of Assign commands, one for each of those often used variables. It doesn't matter what you assign at all. I drag that shared action from my external Library with shared actions to each new project. Variables are ready for use, even as parameters in other shared actions. I use this action to calculate the reference time in seconds (to be used later in calculations) of a frame, mostly the first or last frame of a slide. Defined as a shared action, it needs no parameters. Once dropped into the project Library, I can use it for any frames where I want a reference time. You can copy an object or a slide, which has advanced actions attached to a new project. But that is not always working great. If you have navigation in the advanced action 'Jump to Slide', that command will often be reset to 'Continue' if that slide is not found. Same for objects, variables etc. Choose one of them, you'll have to fill in the parameters, add a name, edit the commands (delete, add as you want) and save as an advanced action. Example: a shared action triggered On Enter for a dashboard, checking a number of tracking variables and showing something special after all variables prove that everything has been visited. 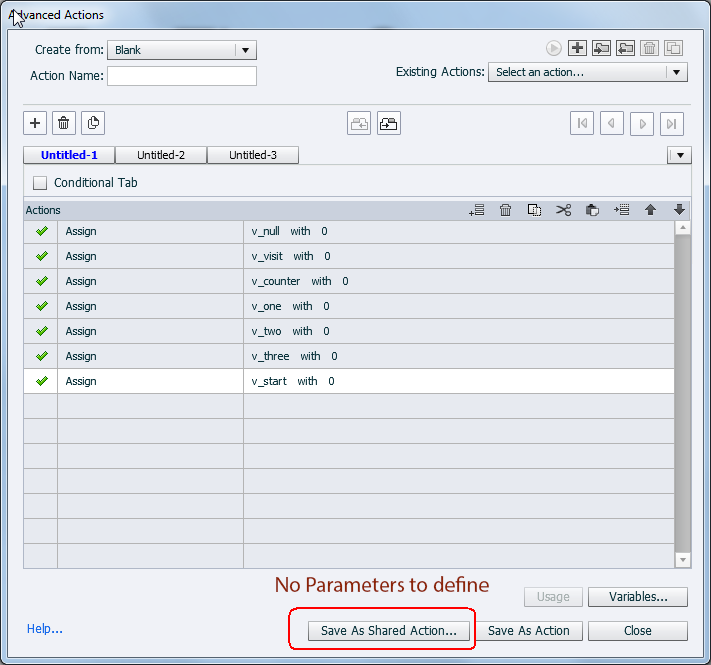 You can set up the shared action for 4 variables. 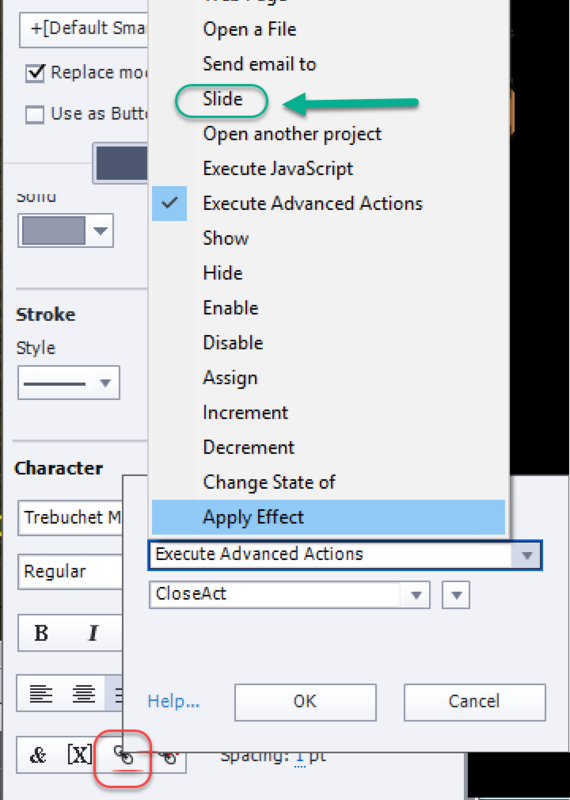 If you need less or more variables, convert the action to an advanced action and edit it! Do you use shared actions? Did you like these tips? Do you want to have some training about variables/advanced/shared actions? I love seeing comments on my posts, and promised: you will always get an answer! In this thread on the Captivate forums, a user asked how to configure navigation in a course with content slides and two help slides. The Help slides should be accessible from each content slide using a button. There is navigation possible between the two Help slides, and the user should be able to return to the content slide from where he started, from each of the Help slides. Although there is a system variable cpInfoLastVisitedSlide, this cannot be used for this use case, because the user can navigate between the two Help slides. I explained shortly a possible work flow with a user variable and a couple of standard actions in the thread. Since the user told that he is a newbie concerning variables and advanced actions, I promised to write out a more detailed tutorial. This is certainly not a complicated use case! If you are an 'expert' in advanced actions, this is not a post to your taste. This project has a Title slide, 3 Content slides and ends with two Help Slides. Master slide 'Content' has the Help button (with the question mark): it is a shape button (no states at this moment in CP9) which triggers a standard advanced action 'ToHelp'. This master slide is used for the content slides. Slide 2 (Content1): has a shape button for Next which pauses the slide at 2.5secs. This shape button is timed for the rest of the project, so that it will show up in all following content slides. A shape button on the master slide is excluded because this Next button has to be hidden on the last content slide. You cannot show/hide an object on the master slide, because it has no ID, no name. This Next button has been labeled 'SB_Next'. For this small example, it can look easier to have a Next button on each slide where it is needed, but if you have a lot of content slides, this approach will save on time and file size. Slides 2,3 (content slides): to be sure that the Next button is visible, even when coming back from the Help slides, the On Enter event of these slides is used for the simple action 'Show SB_Next'. 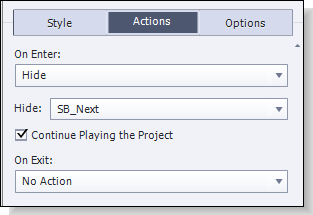 Slide 4 (last content slide): the Next button has to disappear, which is done with an On Enter action 'Hide SB_Next'. 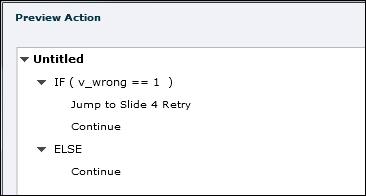 Slide 5 (Help slide 1): has another instance of the Help button (SB_Next_Help) with the action 'Go to Next Slide'. 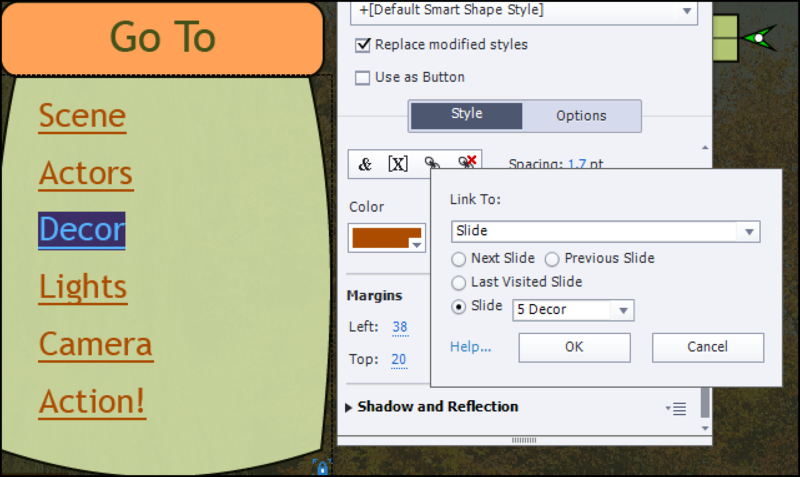 This slide has a special shape button 'SB_Back1' to allow going back to the content slide. 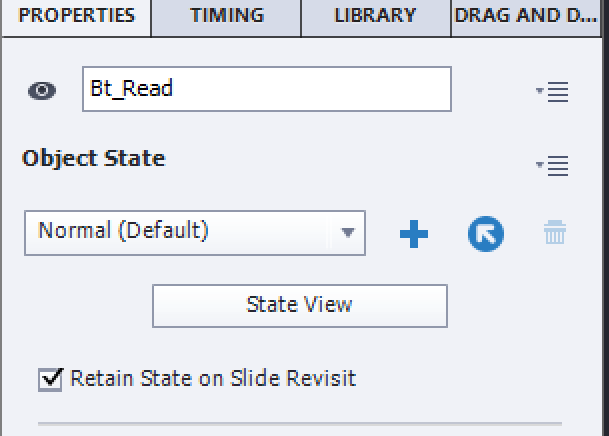 This button triggers a standard action 'BackToSlide'. This shape button has a bubble added in the Rollover state, which functions as Tooltip. The On Enter action for this slide is used to hide the button 'SB_Next' (from slide 2), same way as on the last content slide. Why? That button will already been hidden if the user comes from the last content slide, but not when he is getting here from one of the previous content slides. Slide 6 (Help slide 2): has no need for a Next button, but needs a pausing Back button (to navigate back to the first Help slide) with the action 'Go to Previous Slide'. It has another instance of that special button ''SB_Back2'. I didn't opt to time that button for the rest of the project, because there are only two Help slides and having to hide/show them would have been more work than using two instances. cpInfoCurrentSlide: gives the slide number of the current slide. 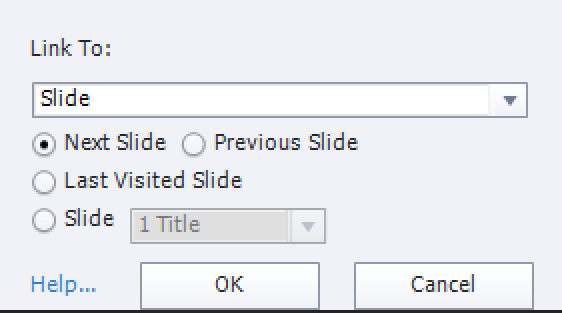 The index starts with 1, which means that for slide 1 this variable is 1.
cpCmndGotoSlide: will be used to navigate the user back to the content slide. Beware: for this variable the index starts with 0. That means that slide 1 has to be indicated as 0, slide 2 as 1. One user variable has to be created: v_last. 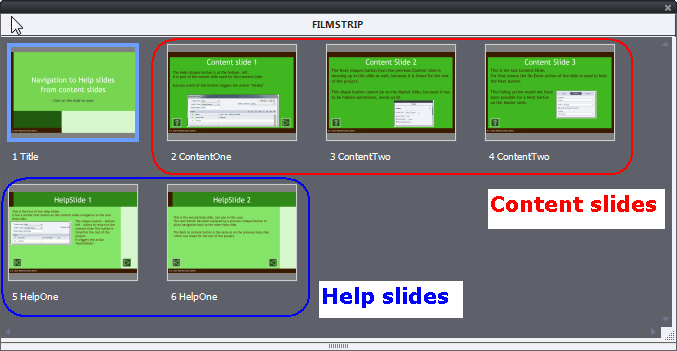 This variable will be used to store the value of cpInfoCurrentSlide when the user leaves the content slide to go to the Help slides. 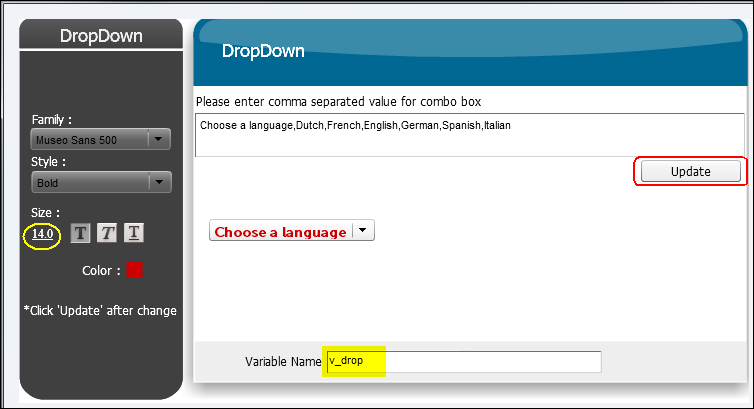 You do not have to define a default value for that user variable. In the first statement, the slide number of the current slide is stored in the user variable v_last. Then the user is navigated to the first Help slide (slide 5), and I added Continue which is not always necessary, depends on the set up of the slides. 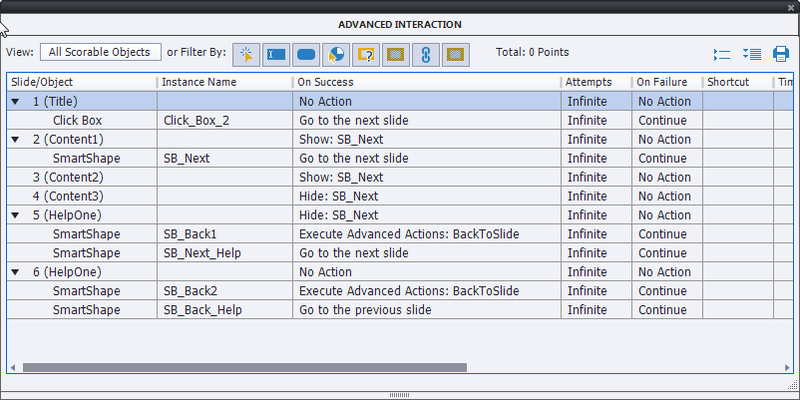 In the Advanced interaction you'll find a great overview of all the actions, events of the slides. Too bad: you'll not see the shape button on the master slide, nor its action. 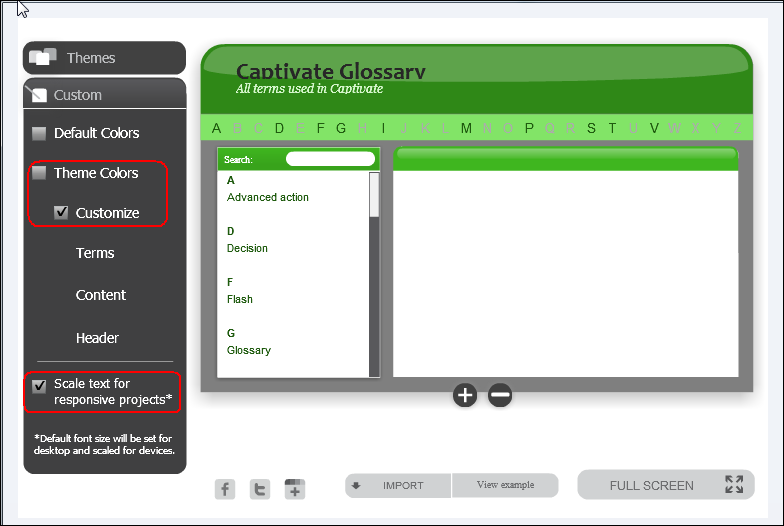 Captivate 8 has included several learning interactions, that are not well documented in the official Help. You'll be able to download a descriptive table at the end of this article. In the past I have been blogging quite a few times about using Widgets. And there was a similar article 'Using Captivate Widgets? Some tips'. Learning interactions is the name used by Adobe to indicate widgets that are compatible with SWF and HTML5 output, whereas the former Widgets were meant for SWF output. Some of the widgets are still available, others have been replaced by a learning interaction. Widgets can be found in the Gallery\Widgets under the installation folder of Captivate. 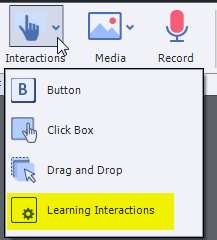 Learning interactions can be found also in the Gallery, but you'll use them from a duplicate folder in Public Documents, which is easier to access if you don't have full administrative rights. In this article I'll offer some general tips. You will see an example movie, using the Radiobutton and Checkbox interactions but I will not explain in depth the advanced actions used for that example. In the Big Button Bar, use the button Interactions, last option. A dialog box with thumbnails of all interactions will be opened. You'll see a badge 'New' or 'Updated' sometimes, when a new version has been pushed to your system. The second work flow is also valid for Widgets, and can be used also if you have problems with the Thumbnails dialog box not showing up. I also prefer it because scrolling through a list with names is more efficient than with the other dialog box. Which work flow you prefer, you'll see the the dialog box to edit the properties and parameters for the interaction popping up. 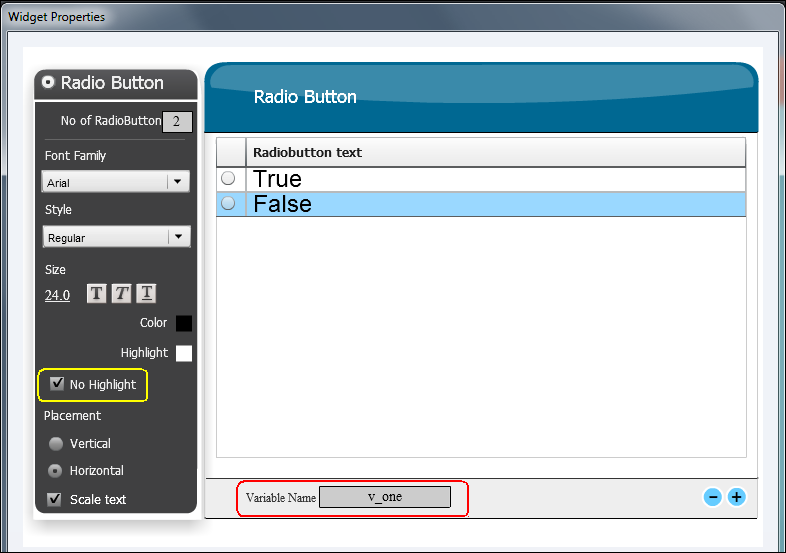 In this screenshot you see the dialog box for a simple radiobutton interaction with 2 options (True/False). I unchecked Highlight because that puts a rectangle behind the words 'True' and 'False'. This is one of the interactions that has an associated variable, labeled v_one in this case. As you'll see in the table, several interactions have one or more associated variables. 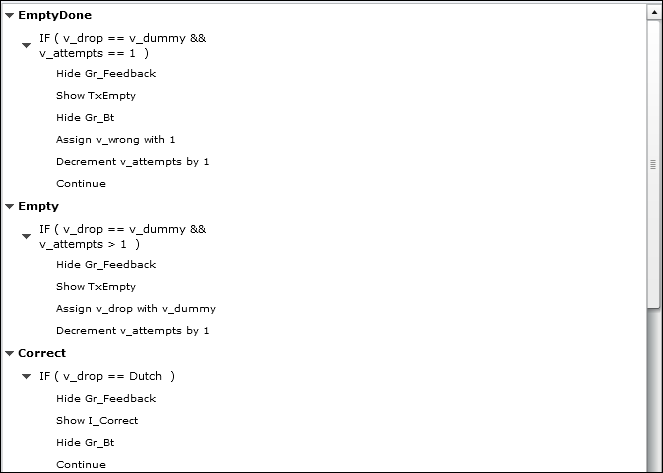 In combination with advanced/shared actions this gives you lot of possibilities for using the interactions. You can have a look at the example movie, using both the radiobutton and checkbox interaction. As I warned already in the article Tips about widgets, mentioned above, those variables are not created automatically because you type their name in the Properties dialog box, you have to create them in the Variables dialog box as well. The type of the variable is mentioned in the reference table that you can download from the link at the end of this article. If you want to test all possibilities you'll have to refresh the browser several times. I'm using the new possibility to control the display of the radiobuttons, they can now be cleared by controlling the variable. On the third slide I use the Checkbox interaction, and if you choose the first option (Captivate 8.0.1) on the radiobutton slide, the first option will already be checked for you, another application of controlling the display, in this case using the same user variable for the first T/F radiobutton and the first option of the Checkbox interaction. The advanced action triggered by the Next button will navigate you to another slide, either slide 4 or 5 as you'll find out. I added a text container with the four user variables v_one...v_four to show how they are changed in the movie. Some interactions recently got an update to improve the user's experience when used in Responsive projects. You'll also find indication about that in the table. Whenever you see the option 'Scale Text for Responsive Projects'. 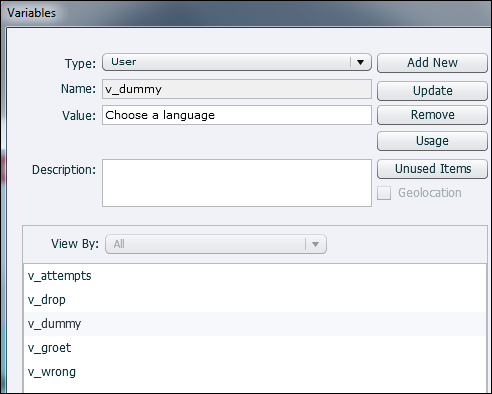 On the screenshot of the Glossary interaction that option is visible. In the former Widgets panel, which disappeared in the new UI of Captivate, you could see that widgets existed in three types: Static, Interactive and Question. Interactions have only two types: Static and Interactive. The difference is the same as for the standard objects: an interactive object (shape button, click box, button, Text Entry Box) has events that can trigger an (advanced/shared) a action and can have a score that can be added to the Quiz total. Non-interactive or static objects do not have those two features. Most learning interactions are Static. Only the Games (with exception of the old Word Search interaction) are Interactive. Beware: although the score for some Games is stored in the associated user variable, you cannot add that score to the Quiz total. The points attributed to a Game in the Reporting section, are granted to the user in the same way as most questions in Captivate (with exception of the MCQ): black-white. If the game has been played, the user will be awarded the points, whatever the score of the game was. Drag&Drop is to me also an interactive interaction, but because of its importance and different work flow it is not in this table.